Demand for sheep and beef farms remained strong through the autumn, as near perfect weather and continuing firm returns for red meat maintained farmer confidence. A 331 hectare north-west Waikato harbour property and a 1,000 hectare south King Country property both changed hands in autumn for around $10,000 per hectare. Several other properties attracted strong interest and should progress into late season sales. However, owners of steeper contoured farms are starting to realise their environmental compliance issues are more problematic than previously understood, which may hinder future sales as the full cost of satisfying the proposed regulations becomes more apparent. 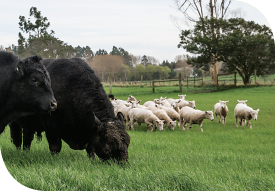 Assuming beef and lamb prices remain buoyant, and the weather remains favourable, the positive status quo in the market for sheep and beef property should prevail through the winter and into the spring. Autumn market activity around North Island dairy farms was similar to the same period in 2017, with no appreciable difference in the volume or value of sales compared to 12 months ago. Presentation and location are critical, however, and demand for properties at the lower end of the market is soft. On farms in the latter category transacted during the autumn, competition among buyers was light, with noticeable discounts and rateable values adjusted down. Overall, few North Island dairy properties were left unsold at the end of May, and fewer are likely to be offered for sale during the winter, so the traditional seasonal downtime in the market may be even more pronounced this year. To balance that, several North Island dairy farm owners are positioning to sell between September and December, indicating a steady market during the spring. Any major decision by South Island dairy farmers is now made with the Mycoplasma bovis outbreak in mind, meaning caution surrounds the market for dairy property and sales activity is low. In Southland, although some smaller blocks transacted in autumn, larger properties attracted little demand. Future farm sales are likely to be completed as going concerns, with the herd included, therefore mitigating the purchaser’s risk of the infection. Run-off grazing properties are in steady demand as farmers look to stay self-contained and keep their stock isolated from the risk of infection. However, with the third best payout in the past 15 years, once the impact of the disease becomes more clearly understood, positive sentiment should re-emerge in the South Island dairy property sector. That may not happen until well into next season. As usual during autumn, several Marlborough vineyards were offered for sale post-harvest, with owners seeking to take advantage of what was another buoyant sauvignon blanc season. A wet March gave some their second challenging harvest in succession. Recent sales show strong demand, as the basics of the industry remain in good heart, with neighbours and established growers purchasing blocks strategically. An eight hectare fully producing Lower Wairau vineyard, bought by a significant local grower in April for $320,000 per hectare, is the current market peak. Meanwhile, the sale of a 27.7 hectare Fairhall vineyard producing premium organic wines will be closely monitored. Market reaction to the increased quantity of vineyards listed should remain generally positive, though demand for smaller vineyards in outlying areas may be less intense. Some larger development blocks are likely to come onto the market in the winter for 2019 planting. Premium Bay of Plenty gold kiwifruit orchards sold between $1.0 million and $1.1 million per canopy hectare through the autumn. A 5.54 canopy hectare Paengaroa orchard that produced 15,000 trays per hectare last season and included a $500,000 house, sold in April for $6.7 million, making it the first orchard to surpass the $1.1 million per canopy hectare benchmark, matched by a subsequent sale in May. Later in the autumn, a 98 canopy hectare offering attracted attention. This sale, likely to be concluded before the end of May, will influence the market. Zespri has now issued licences to grow gold kiwifruit next season, with an additional 700 hectares of new vines set to be planted. Around half of this will be on bare land and the other half will be grafted onto existing rootstock of cut-over established green vines. Although growers are bullish, with plenty of fruit on the trees and expectations of excellent export returns, the availability of labour posed challenges during this picking season. As growers were preoccupied with harvest, autumn orchard listings were light. Some private growers in Hawke’s Bay are finding it more difficult to operate a family orchard, and may decide to sell through the winter or in the spring. If so, they should meet a positive reception from a willing market, comprising corporates, and those seeking to use a pipfruit or stonefruit property as a lifestyle base, living in the house while leasing out the orchard for others to manage. Demand for pipfruit property is strong, as growers seek to extend plantings. Suitable bare land is scarce and some Hawke’s Bay grape vines have been ripped out for replacement by fruit trees. Arable farmers welcomed a rise of around $100 per tonne for feed wheat and feed barley this year, the best prices in the last three years. Although this year’s yield was low for several crops, growers of carrots, potatoes and seed potatoes fared well. With sufficient water for irrigation, Mid Canterbury’s premier arable farms traded between $46,000 and $50,000 per hectare in autumn. Two Dorie properties, of 127 hectares and 40 hectares, changed hands within that range in April, while a 202 hectare Pendarves farm is likely to follow. Local purchasers dominated the market. Fortunes of those in cropping are closely tied to the dairy sector and the Mycoplasma bovis outbreak will have an impact, particularly with dairy farmers cancelling winter grazing contracts they hold with arable farmers. However, with plenty of other options, the latter will not be too seriously affected. Export demand for logs is strong, particularly from China and India, with the weaker New Zealand dollar enhancing the value for exporters. Meanwhile, the domestic market is also rising, with government housing initiatives intensifying demand for timber. Government plans to increase plantings are another favourable factor. However, most in the sector take a long-term view of their involvement, meaning owners prefer to follow through to harvest, and take the income from their trees, rather than cashing in on these conditions ahead of time. Forests approaching maturity, including land and trees, are valued between $25,000 and $30,000 per hectare. After harvest, purchasers stand to net at least $30,000 per hectare, with better prices for better quality timber. Because the outlook is so positive, with few forest owners motivated to sell transactions are scarce and likely to remain so through winter.